Welcome to the final day of the Papertrey Ink February Countdown and the second design team group post day. This time around our focus is on the soon to be released Boutique Accessories. Be sure to check out Nichole Heady's blog for more info on this set. Erin's Boutique Accessories line-up is simply genius! Never has it been so easy to display such a number of hand crafted accessories. Even though I thoroughly enjoyed taking the time to hand stitch a felt hydrangea broach, I enjoyed even more how easy it was to create coordinating and pretty packaging. Be sure to scroll all the way down, I've snuck in a couple cards featuring my other new set for the month... Mini Blooms and Watercolor Wonder! 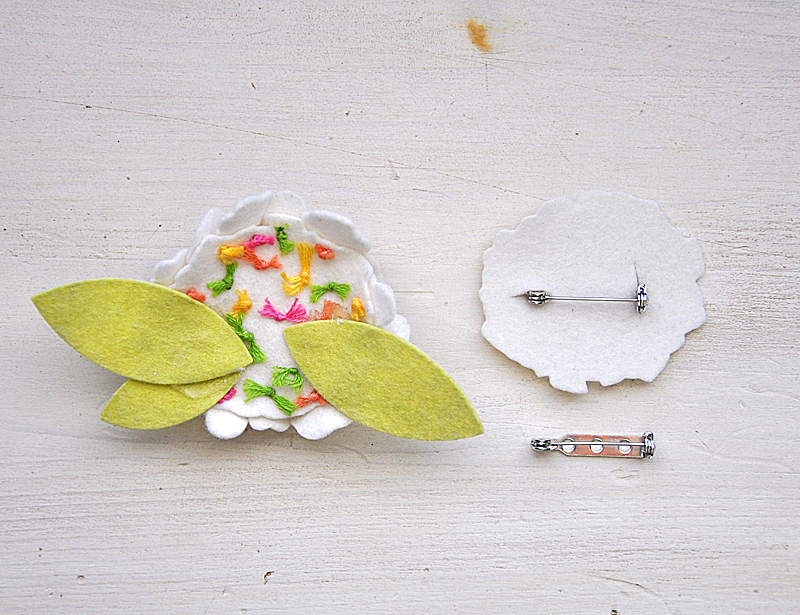 For today's challenge I've assembled and adorable hydrangea brooch constructed from bits and pieces of felt. Below I'll show you exactly what pieces I've used. Here's How: The pieces used for construction... One: bits and pieces die cut from vintage cream felt using the Mini Blooms dies, these were the individual flowers pieces. 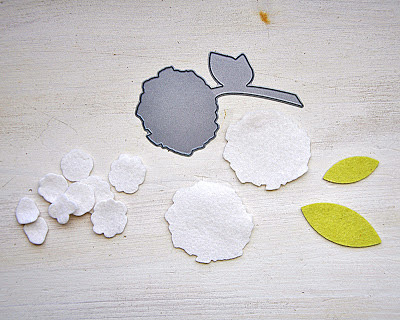 Second: as the base, two pieces were cut using the top portion of the Happy Hydrangea flower die. Third: leaves die cut from limeaid ice felt using the Sending You die collection. The individual pieces were stitched into place using French knots (a novice tutorial can be found here) onto one of the Happy Hydrangea flower die pieces. The leaves were then hot glued into place. The second hydrangea flower was cut to fit the pin and then glued into place to cover the stitching and create a clean look. A close up of the blossoms. 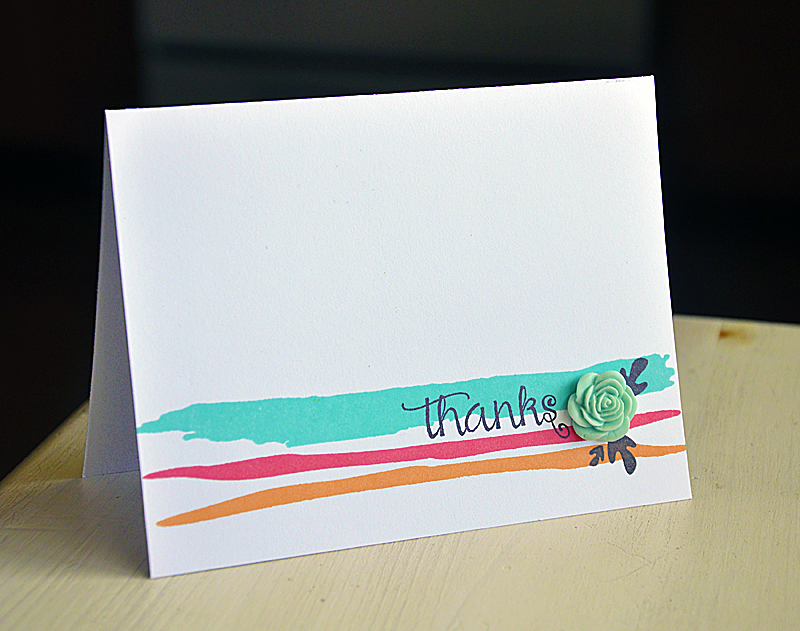 Here's A Note: I opted to incorporate a number of different floss colors for a unexpected pop of color. 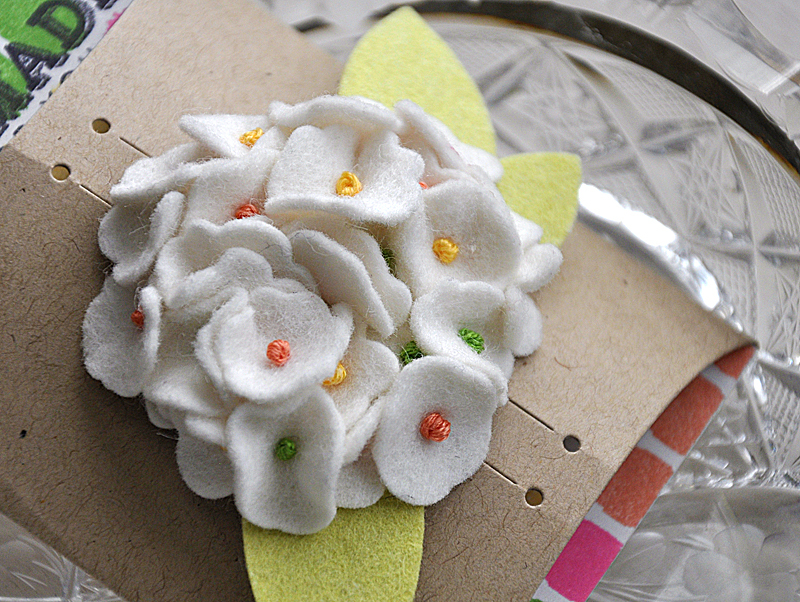 The base of the packaging was inspired by the use of color in the hydrangea brooch. I stamped the Irresistibly Ikat polka dots in coordinating colors. 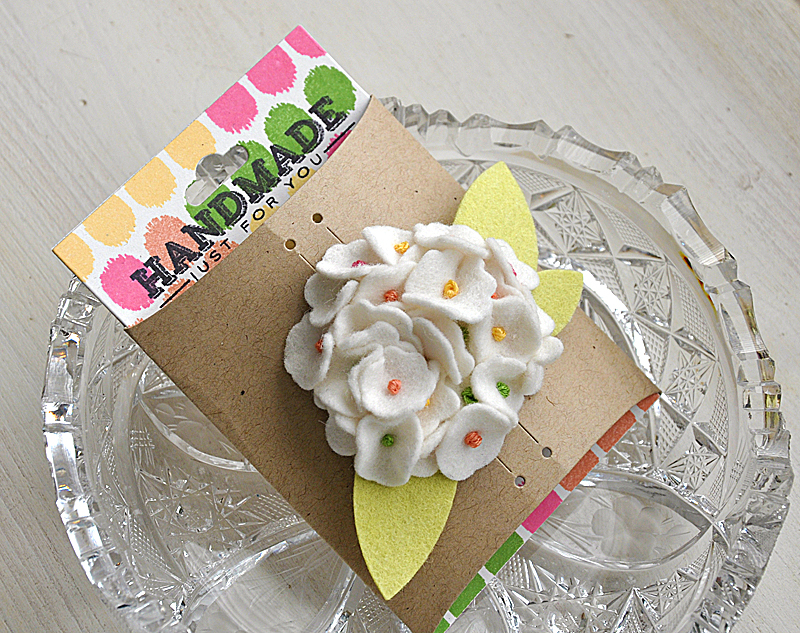 Next, a Mini Blooms sample. This simple creation began by heat embossing the sentiment in black. Over the embossing it was easy to stamp a few individual flowers, in a pretty color combo, directly over the sentiment. Last but not least, Watercolor Wonder. 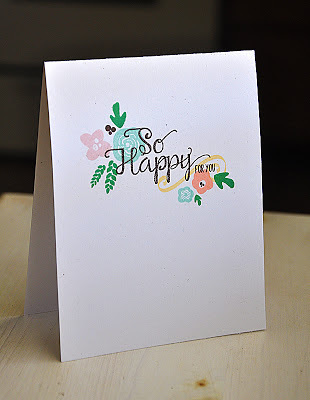 I simply stamped a few painted strokes across the front of a white card base. Then finished the card of with a simple sentiment (you can see a "so much" addition to this sentiment on Nichole tag here, on her first project), stamped leaves and a resin flower (more info on it here). Oh that hydrangea is FANTASTIC, Maile! So cheerful and sweet. 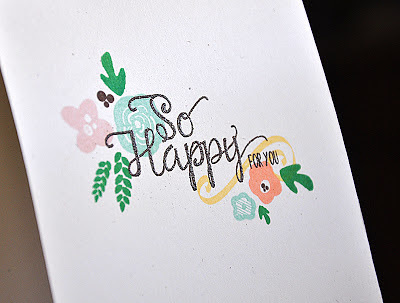 I so love your flower and watercolor sets this month! 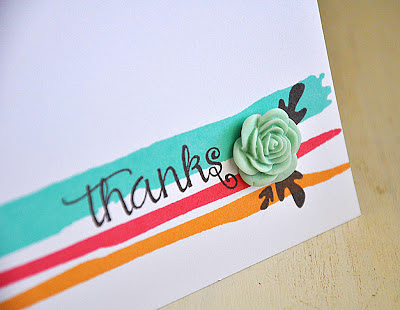 Love those painted strokes from Watercolor Wonder and the Hydrangea pin absolutely stunning. Your directions make it "seem" much easier than the finished product appears! Oh my, I love looking at all your cards! I wish there were more :) ! Everything is beautiful! 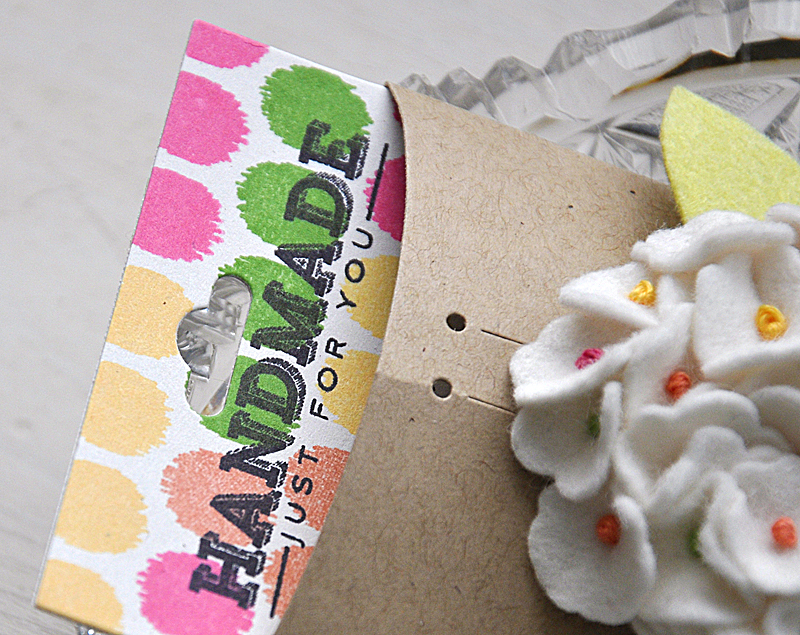 I love the clip/pin you made and that last card is simply FABULOUS! Your pin is so very hydrangea! love the shape and the many colors of centers. Cards are beautiful, too. Um, WOW, that hydrangea broach is incredible!! A true boutique item!! These are just beautiful...all of them! I'm in love with your new sets and that flower is fantastic. All those tiny flowers with the pops of color in the center...swoon. The hydrangea brooch is so beautiful and I love the little french knots for the petals centers. The felt broach is absolutely gorgeous! You must have used a lot of tiny flowers! The cards are equally amazing! Loved the touch of the single resin flower. Gorgeous projects dear!! Love your new sets!!! 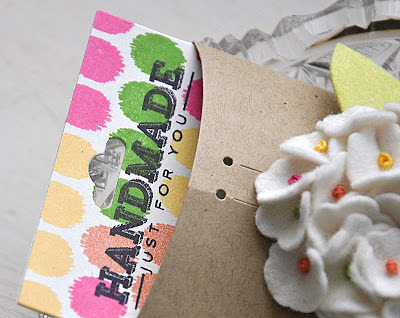 Three more fantastic projects from you....where do you get your fabulous ides. Just dynamite. WOW, that hydrangea is just beautiful! Love the hydrangea with the little pop of color! Gorgeous examples!! Those paint strokes are so fun and the colours so vibrant - what inks are they? what a clever use of the resin flower!! I am in love with your pin & that watercolor card is a looker! That hairclip is so neat! And creative! Love the packaging too! 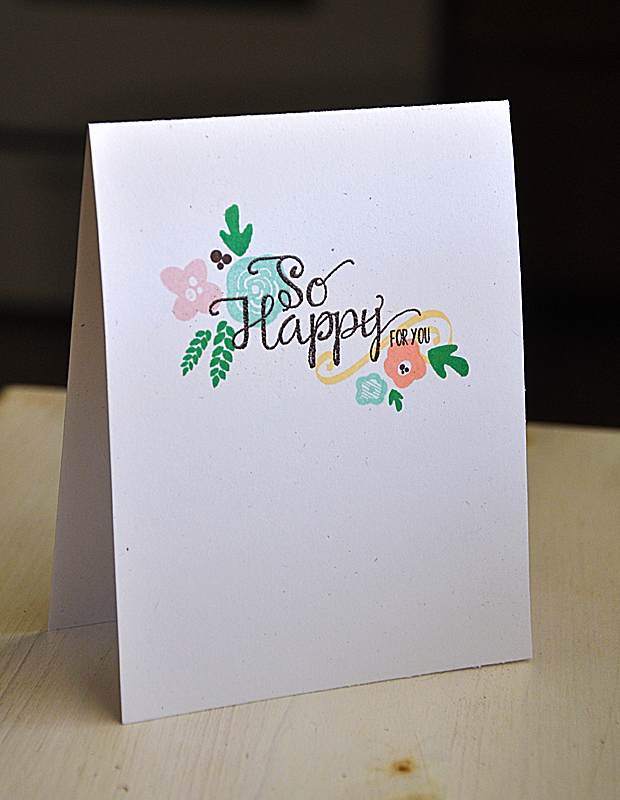 The first card: love that it's one layer! And the colors on the 2nd card! So bright and bold! And I love the flower you used!